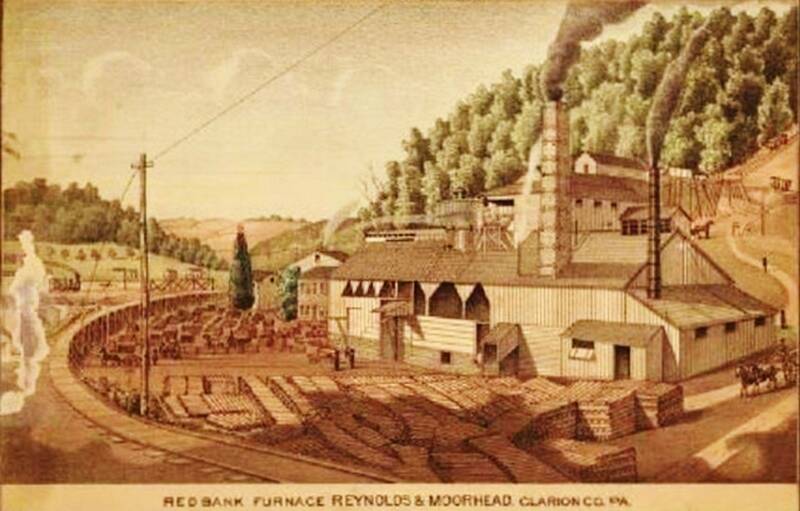 ~ Red Bank Furnace, situated at the junction of Redbank Creek with the Allegheny River, is the only exclusively coke furnace ever operated in the county. 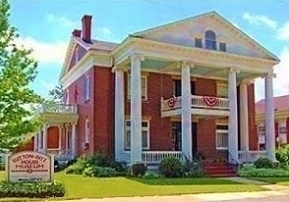 It was built in 1859 by McCullough and Reynolds. When running at its full capacity, it produced one hundred and sixty five (165) tons of iron per week, and employed from three hundred and fifty to four hundred and fifty men, including miners and cokers. It used the native carbonate ores dug from the surrounding hills, and also that brought from the Lawsonham and Sligo diggings. The coke works were situated at the top of the hill. The coal for this and for Sarah Furnace was mined from the Freeport Upper coal contained in the summits overlooking the river above Brady's Bend, and was coked in open hives at the pit mouth. There were twenty four of these hives equivalent to about one hundred and fifty ovens. An inclined plane reached from the furnace to a point on the feriferous limestone, two hundred and fifty five feet above the railroad station. From the plane head a narrow gauge railroad, laid with sixteen pound rails, ran off in opposite directions along the outcrop of the ore. One branch ran up to the coke pits and coal banks, a distance of nearly two miles. The hills around are terraced by the enormous masses of shale removed in mining the ore. In 1878 the furnace began making coke in the ovens at the base of the hill. Forty two ovens were erected. Since December, 1883, the furnace has been out of blast. It blew out for repairs, and owing to the low price of iron, and its inability to compete under such prices with larger furnaces and those mining ore at less expense, it has not resumed. In November, 1886, the furnace owners again began the manufacture of coke, mining at present the lower vein of coal, known as the Catfish vein, averaging three and a half to four feet in thickness. The coal and coke are shipped mainly to Buffalo and Rochester. Two hundred tons of coal and forty tons of coke are shipped daily from the works. One hundred and thirty men are employed at present. In 1865 the firm became Reynolds and Moorehead. In 1878 the owners were Alexander Reynolds's sons, and since 1881 the company has been known as David and John D. Reynolds. Four thousand tons of pig iron are yet stored in the furnace yard, waiting an opportunity for a favorable sale. In connection with the furnace is a company store, managed since 1859 by David Reynolds, who, since 1867, has been superintendent of the entire plant The company owns houses sufficient to accommodate about one hundred families. Formerly there were more, but many have become ruinous. About fifteen hundred acres of land, containing quite a field of ore, as yet untouched, are in possession of the company. Just previous to going out of blast, the furnace was most active.